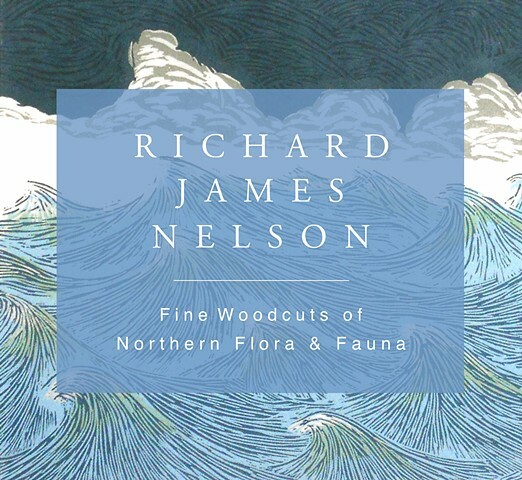 Richard James Nelson is a printmaker specializing in woodcut prints. He began in kindergarten with potato prints, earned a B.A. from The College Of Visual Arts in 1992, and has never quite stopped. When he isnt fixing up his 104 year old home in St. Paul he is at his cabin on Minnesotas north shore of Lake Superior where he can be found wandering aimlessly through the forest, sketching all types of flora and fauna. His work is based on the philosophy that the image should be as simple as possible, with as few colors as possible. He feels the more simple the work, the more the viewer has a chance to connect with the image. His two teenage children fervently disagree about color and tell him frequently. They continually remind him to "add more color dad". Which on occasion he does, then gets confused and might be seen walking through the house bemoaning the fact that he listened to teenagers. He signs his prints as "James" in honor of his father James Nelson. His father always encouraged his pursuit of the arts and taught him to appreciate and respect nature. A Minnesota native, he grew up north of Minneapolis where he learned to commune with tumble weeds and important survival skills including: embrace solitude, repay kindness, accept joy and sorrow, value loyalty and know when and when not to enter the farmers field.